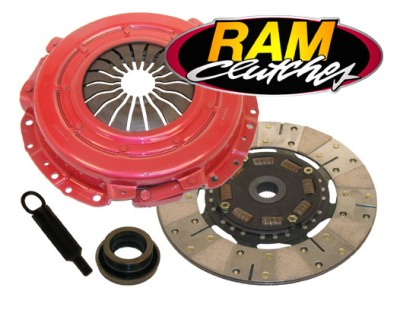 * Includes throwout bearing and alignment tool Whether you're worried about street performance or heavy-duty towing, RAM's Powergrip clutch kits will give you 30 percent more holding power over stock, and up to 60 percent more capacity in the Hi-Clamp HD sets. The friction material may be one of three types--KEVLAR®, metallic, or premium organic. The specific material chosen for each application is tailored to that particular vehicle for optimum performance. The kits include the pressure plate, clutch disc, and a clutch-alignment tool. The flywheel must be resurfaced to validate the warranty. Our Quality & Finish will leave you with a grin from ear to ear as it is the Best looking unit available for your Ford Mustang or Cobra. Quality Construction: No one else gives you the bold clean styling of our Aftermarket Dress Ups, Suspension and Performance Parts for your American Muscle Car like UPR Products! Click Here for Instructions Fits these Vehicles: 2001 2002 2003 2004 4.6L V8 LX GTS GT Mustang Steeda Roush & Saleen Vehicles. Made in the USA!